Rick Platt: Port Authority 15 Years Ago Today. . . Port Authority 15 Years Ago Today. . . 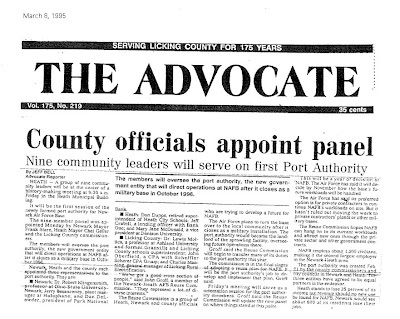 It was on this day in 1995 that The Advocate reported on the yet-to-be-formed Heath-Newark-Licking County Port Authority. News of the appointment of the nine members of the Port Authority Board of Directors were announced. Today, 15 years later, two members of that original nine-member Board continue to serve. Ms. Mary Jane McDonald, then of Denison University, chairs the Community Projects Committee and Dr. Bob Klingensmith, a professor at Ohio State University-Newark, chairs the Personnel Committee. The Port Authority Board, past and present, reads like a Who's Who of Licking County leaders.